Prezentare (Fake Book). 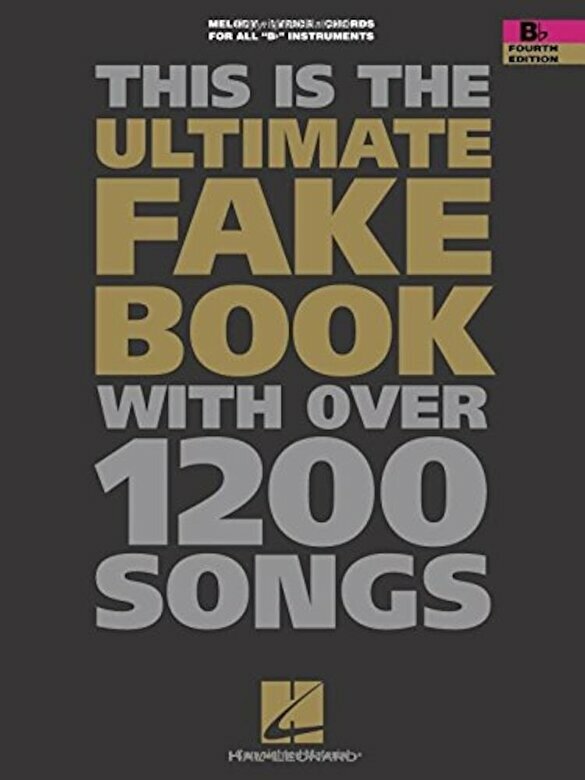 This fake book is a cornerstone for many musicians' libraries. With over 1200 songs in all styles, this fourth edition has been updated to include even more great songs and recent hits. From jazz standards to Broadway blockbusters and country classics to pop chart-toppers, this book has the songs you're looking for all in one convenient collection. It is comb-bound with locked tabs to ensure long-lasting durability. Alfie * All the Things You Are * Always * And So It Goes * Autumn in New York * Beauty and the Beast * Blue Skies * Body and Soul * Brazil * Call Me Irresponsible * Can't Help Falling in Love * Candy * Caravan * Change the World * Cry Me a River * Duke of Earl * Easter Parade * Edelweiss * Endless Love * Everyday * A Foggy Day * Friends in Low Places * Georgia on My Mind * Heart and Soul * Here's That Rainy Day * How Deep Is the Ocean (How High Is the Sky) * I Love Paris * I Shot the Sheriff * I'm Always Chasing Rainbows * I've Got the World on a String * The Impossible Dream * Isn't It Romantic? * It's Only a Paper Moon * The Lady Is a Tramp * Lazy River * Let's Fall in Love * Love Is Here to Stay * Makin' Whoopee * Memory * Mona Lisa * Moon River * Moonlight in Vermont * My Funny Valentine * My Heart Will Go On * Oh, Pretty Woman * Operator * Piano Man * Precious and Few * Release Me * Roxanne * Satin Doll * Small World * Somewhere Out There * Sophisticated Lady * Speak Softly, Love (from The Godfather ) * Splish Splash * Strawberry Fields Forever * Summer in the City * Tears in Heaven * Ticket to Ride * Unforgettable * Waltz for Debby * What'll I Do? * When I Fall in Love * When You Wish Upon a Star * You Are the Sunshine of My Life * You're Nobody 'til Somebody Loves You * and hundreds more Editions also available in C and E-flat.